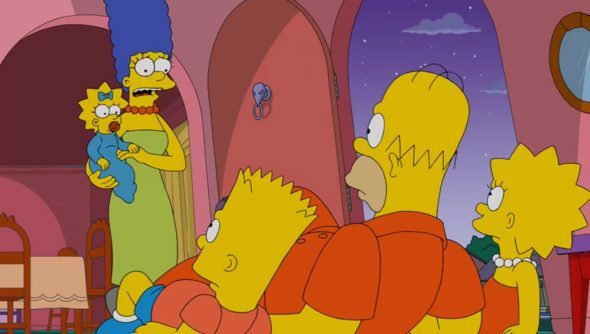 The Simpsons on FOX: Cancelled or Renewed for Season 30? Will Homer, Marge, and the kids go on forever, or is their story near its end? Has the The Simpsons TV show been cancelled or renewed for a 30th season on FOX? The television vulture is watching all the latest cancellation and renewal news, so this page is the place to track the status of The Simpsons season 30. Bookmark it or subscribe for the latest updates. Remember, the television vulture is watching your shows. Are you? An animated sitcom airing on the FOX television network, The Simpsons features the vocal talents of Dan Castellaneta, Julie Kavner, Nancy Cartwright, Yeardley Smith, Harry Shearer, and Hank Azaria. The comedy centers on the dysfunctional Simpson family, as well as their neighbors, friends, and life in the fictional town of Springfield. A safety inspector at the Springfield Nuclear Power Plant, the buffoonish Homer (Castellaneta) is married to Marge (Kavner), a sweet, if typical housewife. Together, they have three children. At ten years of age, son Bart (Cartwright) is a consummate troublemaker. Their precocious middle child, eight-year-old Lisa (Yeardly Smith), is charismatic, if a bit geeky. Baby Maggie may not be verbal, but she expresses herself both with her wide eyes and the help of her trusty pacifier. The family dog, Santa’s Little Helper, and cat, Snowball II, round out the household. In its 29th season, The Simpsons is averaging a 1.42 rating in the 18-49 demographic and 3.45 million viewers. Compared to season 28, that’s down by 20% and down by 17%, respectively. Find out how The Simpsons stacks up against the other FOX TV shows. On November 4, 2016, FOX renewed The Simpsons through season 30 which will debut on September 30, 2018. Stay tuned for further updates. The Simpsons continues to be my nemesis, but I’m not sure I’d eat it, unless I had a Geiger counter handy. Since it is already renewed through season 30, there’s no worry it will be cancelled anytime too soon. I think it’s more likely that the creative team will decide to end it, than that the network will cancel it. Still, things can change, so I will keep an eye on the Nielsen ratings and the entertainment press and update this page with any breaking developments. Subscribe for free updates on any cancellation or renewal news regarding The Simpsons. Check the rankings for all current FOX TV shows. Find more The Simpsons TV series news or other FOX TV show news. What do you think? Are you still watching The Simpsons TV show on FOX? Should it be cancelled after season 30, or continue long beyond? The Simpsons: Has the FOX TV Show Been Cancelled or Renewed for Season 29? This is last season ever of the Simpsons no more of it after this season. It Shame to our society how it become tv show classic should not on anymore my opinion I am only 23 yrs old too many rerun of it. It older than gunsmoke classic show. Honestly, The Simpsons should have ended at season 9 (and even that is pushing it, the two seasons before it were mediocre). It’s been running on empty for TWENTY YEARS NOW, it’s time to end it. 30 seasons is a nice round number anyway. Please end series after next season too old tired 3 decades long good enough great show need say goodbye creater adult animation comedy.